When I was bitten. No, actually, it started long before then. I first became interested in vampires when I was a young mortal child. At first I was very frightened of vampires because Dracula was the only monster I never felt sorry for. Frankenstein, Wolfman and the Mummy did not choose their fate. It was forced upon them. Dracula chose to become a vampire and to be evil. That’s why I never had any sympathy for him. Most vampires after Dracula were not given a choice. If a vampire wants you, they take you. Although, some of the victims want to become an undead blood-sucking creature of the night, so that’s on them. Also, vampires are very classy - well, except for the ones who “live” in the sewers and feed on rats and spiders. How did you get involved in the fantasy/horror aspect of history? It just seemed to fit, unfortunately. When I began writing The Vampire Tour of San Francisco, I first wrote the script as only true history. Then I went back and, where I thought it fit, I added in the vampire lore and humor. I was surprised at how easily it fit into the real history. 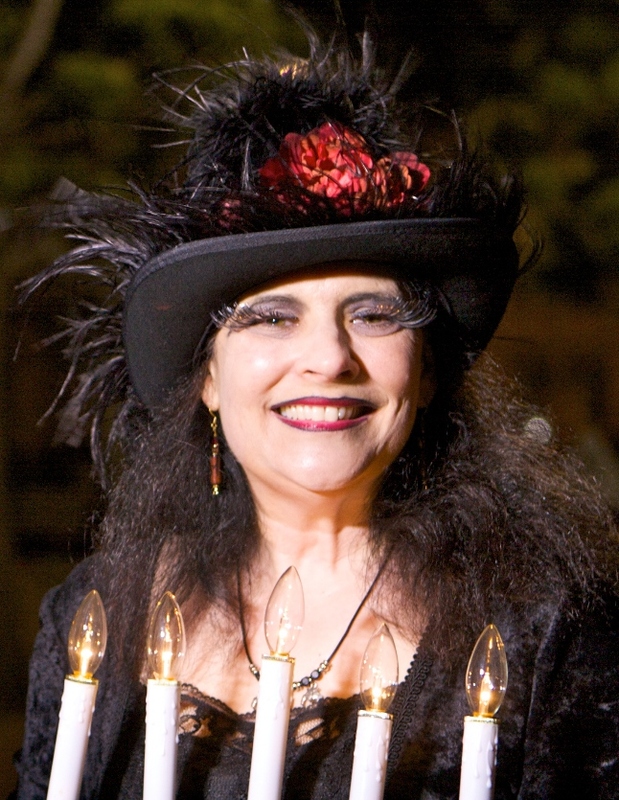 Tell us about the Vampire Tour of San Francisco. The tour takes place on top of Nob Hill, a very beautiful area of San Francisco. I conduct the tour in costume and in character as Mina Harker from Dracula. The stops are: Grace Cathedral, the Nob Hill Café, Huntington Park, the Pacific-Union Club, the Fairmont Hotel, and the Mark Hopkins Hotel. I tell the history of each stop and how vampires played a role in that history. I also include a few areas of San Francisco that are not on Nob Hill, such as Alcatraz, Civic Center, the Financial District, and the cemeteries that were moved from San Francisco to Colma, just south of “The City” over a century ago. The script contains about 85% true history with fun vampire lore and humor mixed in. It is not dark and gory, but presented in a way to entertain and amuse the audience, and is suitable for all ages. Are you an Anne Rice fan? Yes, Anne Rice is a wonderful author! I mention her once on the tour to honor her contribution to literature. One reason they remain popular is because they take the reader out of reality and exercise their imagination. The fear factor in horror books gives a thrill like the one you get riding a rollercoaster. The ending of the book has a lot to do with the excitement you get from reading it. If it ends with good being victorious, you are left with feeling safe and relieved. If evil wins in the end, the excitement of fear and anxiety lets the adventure continue in your imagination. People who are successful inspire me. They don’t have to be a successful writer, as long as they were persistent and made a beneficial contribution to the field they are working in. This could be entertainment, medicine, education, sports, art, or any field at all. I love hearing success stories. They really keep me going. What do you think the difference between an American and British vampire tour is? I have also written, The Vampire Tour of New York, which takes place mainly on the Upper West Side, and begins at the Imagine Stone in Central Park and ends at The Jekyll and Hyde Club. This tour is written to be conducted by Dr. John Seward from Dracula. I would say that the main difference between the American and British vampire tour, the way I write them, is just the location. I write them all to contain mostly true history with fun vampire lore and humor, so they will educate as well as entertain. I have only taken one other vampire tour, and that was in New Orleans. That tour is not like mine because mine is mostly true history with fun vampire lore and humor mixed in. The tour in New Orleans is very horrifying and gory. If that is what you are looking for, you will love it! Dracula is still the best in my opinion. That book is so beautifully written, and really gets your imagination tingling. I couldn’t read it right before I went to sleep. I did that once and was up for hours! My other favorite was Anne Rice’s, The Vampire Lastat. I think that is my favorite from her series, Vampire Chronicles. I have to pay homage to the original, Dracula of course. Others I will never get tired of watching are: Bram Stoker’s Dracula, An American Werewolf in London, which I just watched again the other day, The Howling, Wolfman, Frankenstein, Shadow of the Vampire, Psycho, King Kong (the original), A Nightmare on Elm Street, and of course, Abbott and Costello Meet Frankenstein and Young Frankenstein must be on the list. Getting published is my greatest accomplishment. I never expected that to happen, and Samuel French has published 5 of my plays. I still have a hard time believing that. Since I wrote the script for The Vampire Tour of San Francisco, the tour’s success is also included in this accomplishment. I am so very grateful to God for giving me the talent of writing. It has enhanced my life tremendously! Do you have any advice for newcomers in the industry? I think the best advice I could give someone is to think of an idea that intrigues you, and let your imagination run with it. Trust your imagination and don’t stifle it. It’s the best friend a writer could have, especially if you are writing horror or fantasy. Also, don’t give up. If you don’t get the results you want right away, don’t let that discourage you. Keep going. What is your opinion of modern vampire novels? I like the novels that are well written with interesting stories. If the gruesome details are done in a way that is fitting to the story, that’s great; however, some books are overly gory just for the sake of being gory, and to me, that is not good writing. Is Dracula still the greatest vampire novel ever written? I would say that it is, mainly because the writing is gripping and never boring, from the first page to the last. Besides, it was the original novel that opened the door for so many authors to come. Since I recently retired, I am currently writing a new play about being retired, which is a lot of fun for me. I am also gathering information to write a new vampire tour as well. This one will take place in Hollywood. That just fits too perfectly to pass up! My involvement in the entertainment field began when, to my shock and amazement, I was cast in a musical production in the San Francisco Bay Area at the age of 27. Opening night, when I took a bow for the first time, I was hooked! For the next 10 years, I performed in one show after another. I also worked behind the scenes of shows, learning how to build and tear down sets, as well as working with props, lights and sound, and stage managing. The next step just naturally seemed to be writing a play. Once again, I was shocked and amazed when the first play I sent in to Samuel French was accepted and published. Four more followed. I had a wonderful day job, working in the training department at the pharmaceutical company, Roche. We had a training session in New Orleans, which was when I took the Vampire Tour in the French Quarter. As we walked with the tour guide and listened to his stories, I thought to myself, “Why isn’t anybody doing this in San Francisco.” As they say, the rest is history.